Protesters at Miami International Airport faced a line of Airport Security agents, stretching from Door 8-9. Haneen Ismail, a Jordanian-American student, said she went to the protest at Miami International Airport to be the voice of "my brothers and sisters in other countries that don't have voice." About a 100 people gathered at Terminal 4 of Fort Lauderdale International Airport to protest against Trump's refugee ban. Protesters at Fort Lauderdale International Airport protested peacefully outside baggage claim at Terminal 4. The Ismail family lives in Miami, they’re from Palestine. They came together at Miami International Airport to protest Muslim Ban. Protesters hold up their signs to oncoming traffic at Miami International Airport. Octavia Yearwood, 33, stood on the pavement between police and hundreds of protesters at Miami International Airport on Jan. 29, 2017. "Police told us to get off the street, but I don't want to get off the street," she said. Hundreds of people rallied against Trump's executive orders on immigration at Miami International Airport on Sunday, Jan. 29, 2017. A family with Syrian roots protest against Trump's executive order to limit refugee from entering the U.S. at Miami International Airport on Jan. 29, 2017. Protesters march and chant against Trump's executive orders restricting refugees from entering the U.S. at Miami International Airport on Jan. 29, 2017. 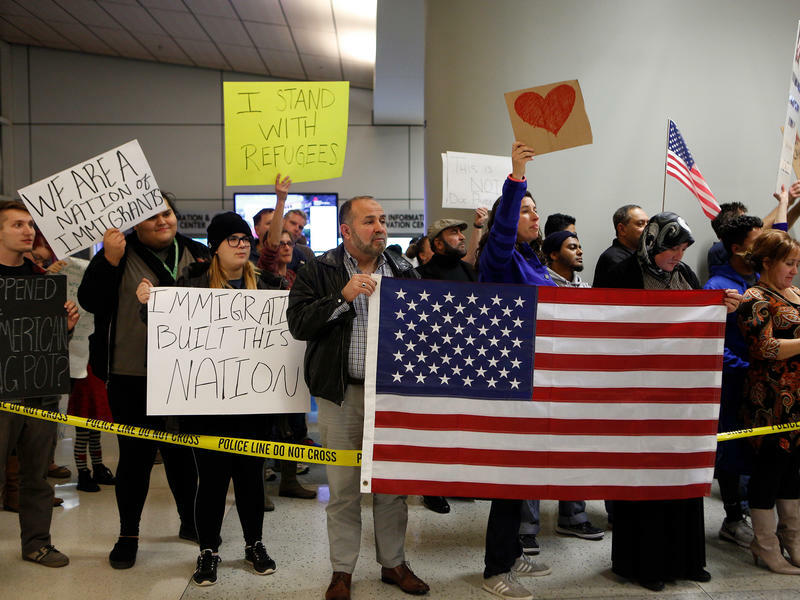 Americans gathered at a number of U.S. airports over the weekend – including Miami International Airport, Fort Lauderdale International Airport and Palm Beach International Airport – to protest President Donald J. Trump’s order to keep many foreigners out of the country. Shouting slogans like "No Hate No Fear, Immigrants Are Welcome Here," an estimated 300 people braved a cold rain outside the main MIA terminal to decry Trump's controversial immigration ban. The executive order Trump issued last week bars all refugees from entering the U.S. for 120 days. It stops citizens of seven mostly Middle Eastern countries from coming here for 90 days. Trump calls it a U.S. security measure. But the hundreds of MIA protesters called it a discriminatory move against Muslims. Miami software systems analyst Michael Keshani said his parents were born in Iran – one of the seven Muslim-majority countries on the ban list. He added he's not surprised federal judges began blocking Trump’s order over the weekend. Mikaela Kursell, from Deerfield Beach, said President Trump’s sudden executive actions to ban refugees, left her in distress. She's an American citizen born in Canada with a mixed European background. Marcia Olivo, of the Miami Workers Center joined the hundreds of protesters at Miami International Airport. She says she worries for the safety of women immigrants in the country illegally. “I do a lot of work with women survivors of domestic violence, and I know that many of them are afraid of calling police when being abused, because of the fear of being put in jail and being deported,” Olivo said. Lawyers from ACLU Fl. and Community Justice Project Miami were at MIA International, as well as Democratic state senator Jose Javier Rodriguez. “The folks who are fleeing war to come to our country are innocent, are our allies. They’re working with us, we rely on them, we need them here and we welcome them here. This is completely absurd,” Rodriguez said, about the bans. Unlike airports like JFK in New York, Miami International is not seeing many controversial cases regarding the immigration order, such as automatic deportations. That’s because most foreign arrivals here are from Latin America, which has no countries on the list. But an Iranian-born chemical engineer who has a U.S. green card (legal residency) posted Facebook reports Sunday that U.S. Customs officials detained him at Port Everglades in Broward County after he returned from a cruise. He was later released. More than 100 protesters were also present on Terminal 4 of the Fort Lauderdale International Airport and around 200 congregated at the Arrivals Terminal of the Palm Beach International Airport on Sunday afternoon to protest the Trump administration decision. 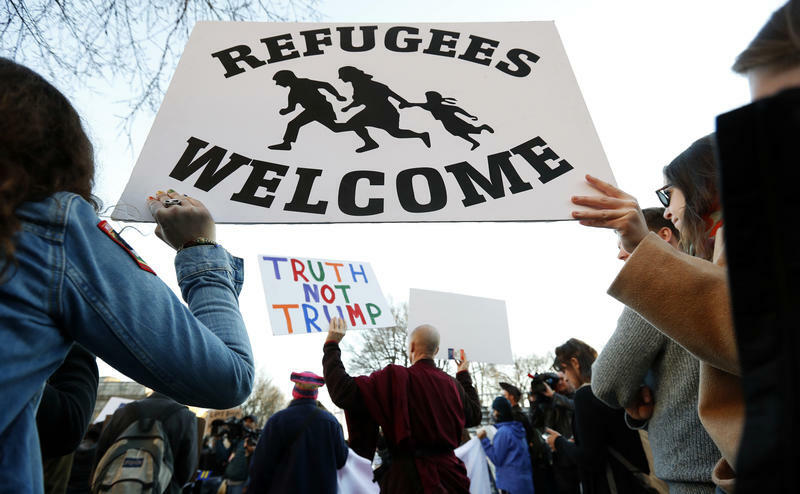 By the time the sun rose on Sunday in the U.S., the chaotic weekend set in motion by Trump's executive order on immigration was beginning to give way to greater clarity — in some respects, at least. Fearing a loss of millions of dollars for defying immigration authorities, Miami-Dade Mayor Carlos Gimenez on Thursday ordered county jails to comply with federal immigration detention requests — effectively gutting the county’s position as a “sanctuary” for immigrants in the country illegally.